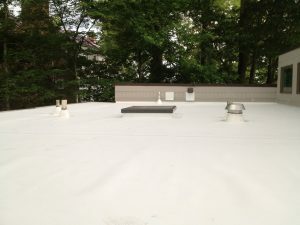 Leaking flat roof-when to repair or replace? 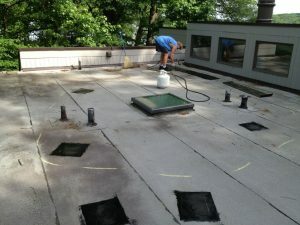 This project started with a leaking flat roof at the skylight; the Owner called us to report that she was seeing stains. We first went out intending to repair the roof (not replace) because it was only six years old; a roof like this should have a service life of 15-20 years if properly installed. When we got up on the roof it felt soggy- in some areas it felt like we were walking in mud as we could feel the roof sinking beneath our feet; when fiberboard insulation gets wet it turns into mush. We alerted the Owner and told her that this might not be a quick fix; since there was no attic space to inspect the underside of the roof the only way to truly asses the roof was to perform a few test cuts to see what was really going on. The testing was done with no further obligation than the small service charge for our time and materials. 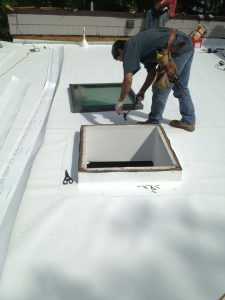 Flat roofs typically have a layer of rigid insulation board beneath the membrane, the insulation protects the modified roofing from the relatively rough roof deck and gives a smooth surface for the membrane. When insulation gets wet it can cause mold and rot to the structure. To see how the bad the damage to the insulation was we cut out a few test plugs; the test plugs allow us to see all the way through the roof with minimal destruction. 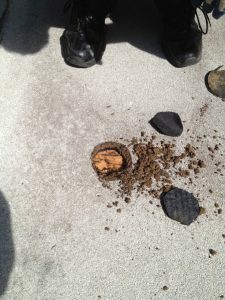 The crumbled brown material you see is what happens to cheap wood fiber insulation board when it gets wet- if it wasn’t water damaged it would come out in a solid puck. The test cut through the roof membrane will show us the condition of the insulation and roof deck. 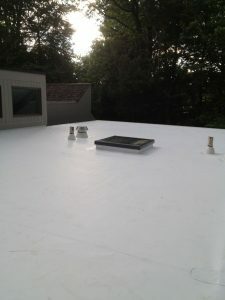 The dark patches you see are being installed to cover over our test plugs to keep the roof watertight while the Owner has time to make decisions. The yellow chalk marks represent the area where we found wet insulation- the patches outside the lines were dry. 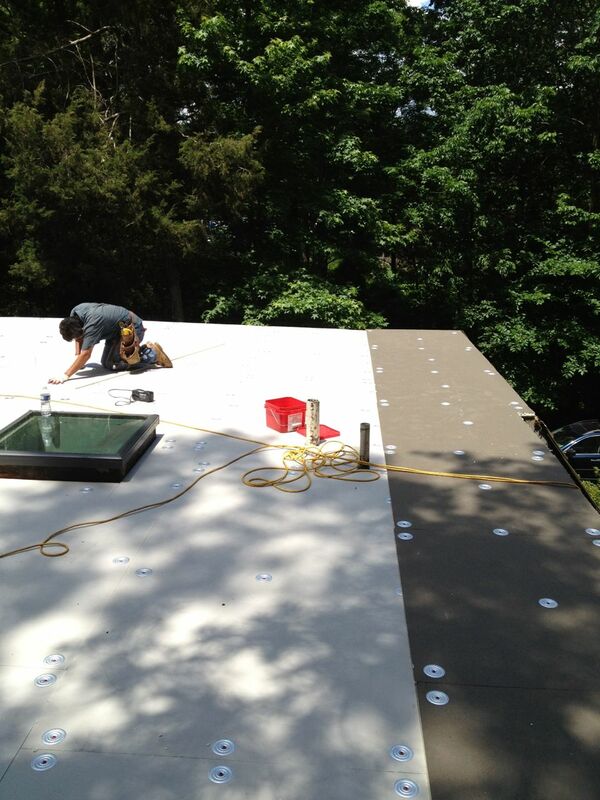 The dark patches you see are being placed over our test cuts to keep the roof watertight while we coordinate installation. We performed test cuts on the outer edges of where we found the roof to be leaking, as you can see by this picture and the one above nearly all of the roofs insulation was water damaged. 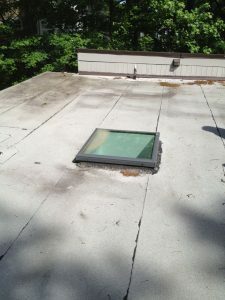 When flat roofs are compromised over more than 30% it really doesn’t make sense to repair it or do remedial work- its cheaper and better in the long term to just replace it. We reported our findings and test cuts to the Owner and she agreed that it really didn’t make sense to try and keep the roof. We provided an estimate and written report the following day; the owner used our report to gather a few more estimates from other roofing contractors- no it didn’t hurt my feelings- like any good doctor I always encourage second opinions. 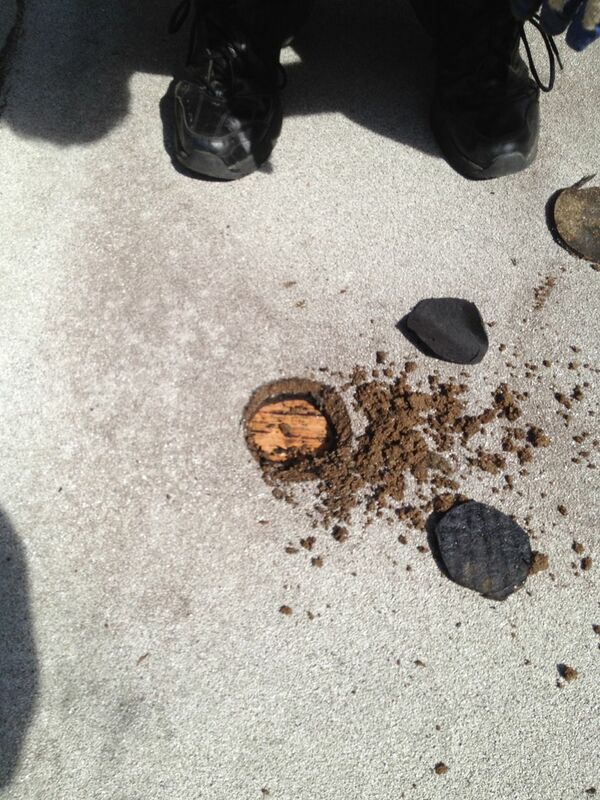 Test plugs are a quick and minimally destructive way to asses the condition of a flat roof. Two weeks later we came back to replace the roof; after gathering four more estimates the Owner came back and hired us to replace her roof. Off with it !! 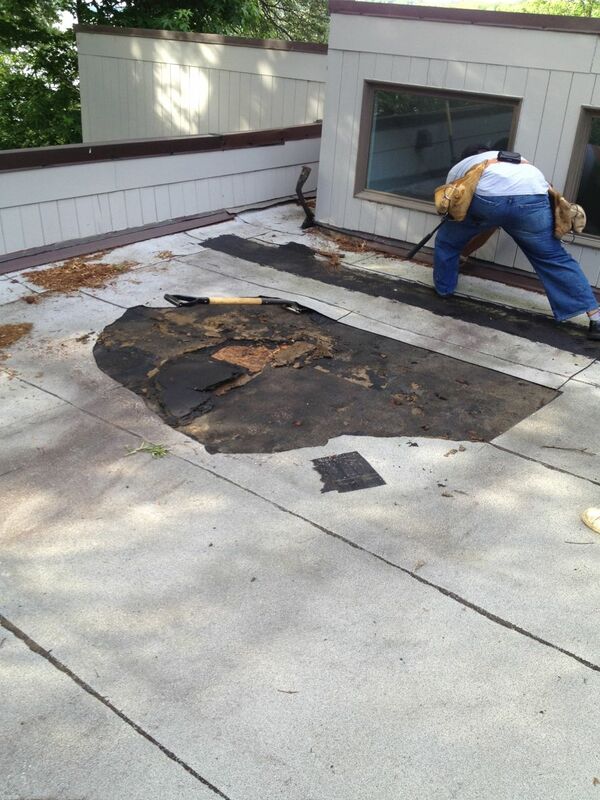 Removing the old leaking flat roof. 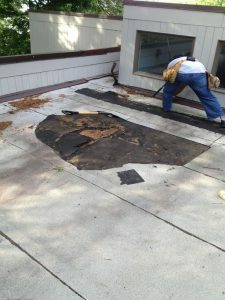 Most of the plywood roof decking was in good shape but some had started to rot. Oddly, most of the rot was outside of the wet areas we saw in the test cuts; this may have been damage that was existing on the roof when the last contractor replaced the roof six years earlier; deteriorated and wet wood needs to be removed or the rot will spread like cancer. 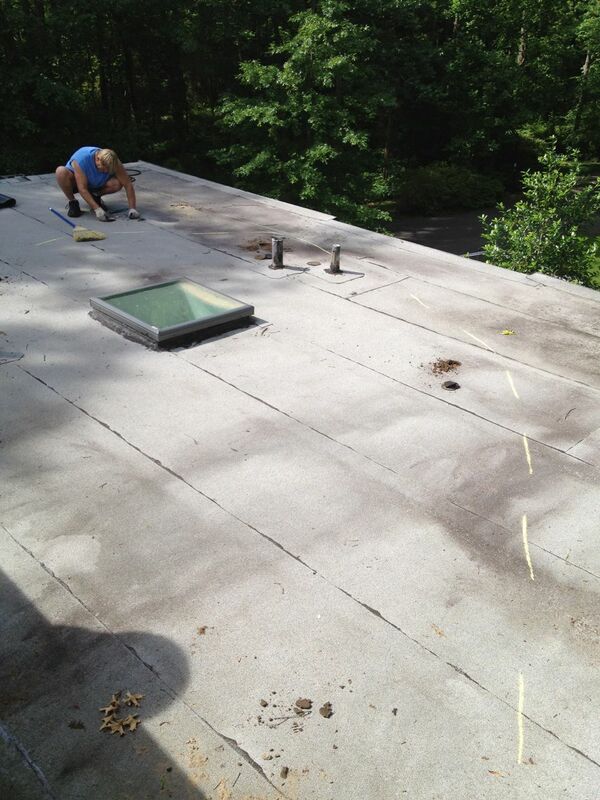 Here we’re replacing plywood roof decking that had started to rot. The white panels are new polyisocyanurate (is0) insulation board; they’re much higher performance and longer lasting than the cheap wood fiber insulation board we removed. 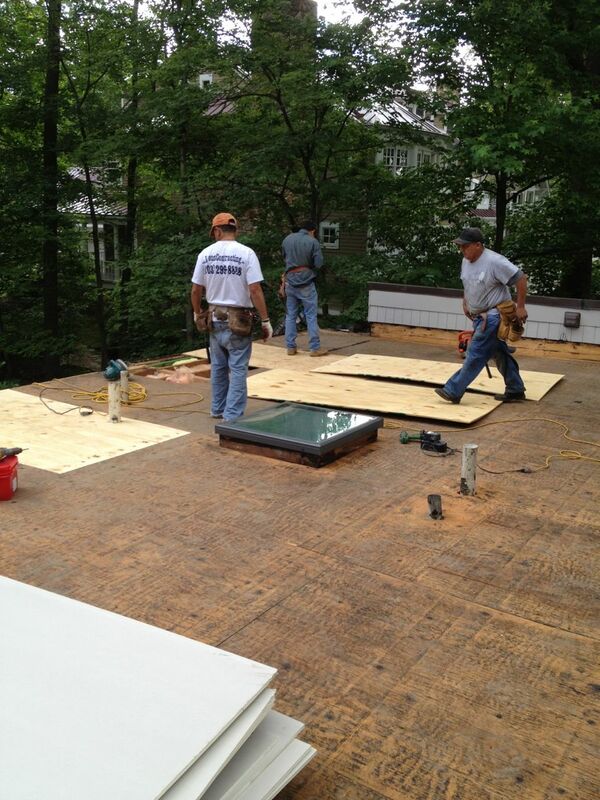 Installing new flat roof insulation board. The white membrane you see is Firestone Ultraply TPO in bright white. The seams and flashings of the material are welded with a hot air welder; when done properly the welds are as strong as the material itself. 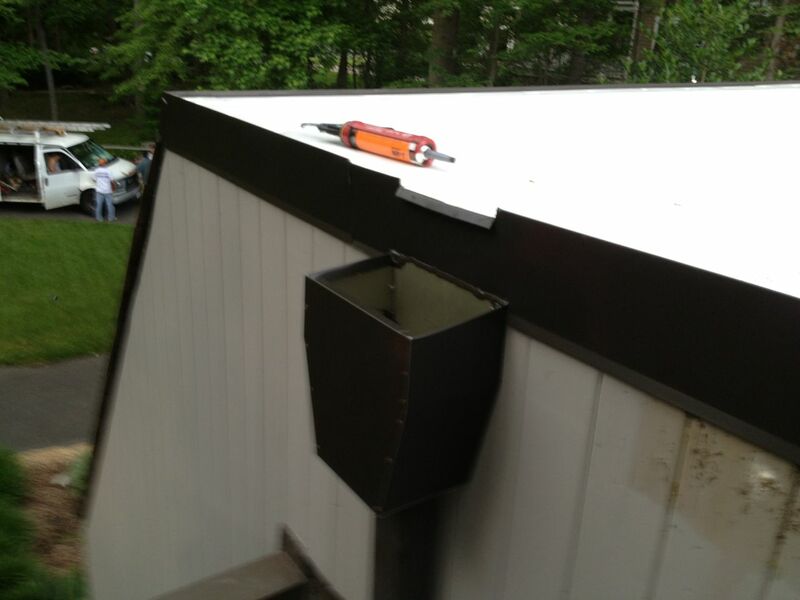 We installed new flashings on all the plumbing pipes and a new vent for the bath fan. I made a new conductor box to carry the rainwater to the ground- sorry for the blurry shot. If you’re having trouble with a flat roof give us a call or fill out the form to the right and we’ll be right with you. We can perform the same testing service to provide you with a clear understanding of your roof’s condition; then you can make the right choices and possibly save yourself thousands of dollars in future damage or wasted money on un warranted repairs.